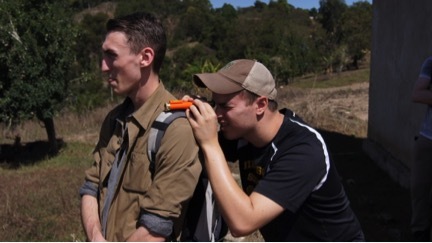 The Bomalang’ombe team headed to a local school to investigate why their water system has never worked and see if they could fix it. The Bomalang’ombe team included Andrew, Max, Catie, Kevin, Kindra, and was led by Paul. Rachel, a student at the University of Iringa studying community development, and our interpreter/guide Frank also joined us. We arrived in Bomalang’ombe after a bumpy 3 hour drive to a surprisingly nice hotel in the village. It had running water and electricity, which was more than we were expecting. 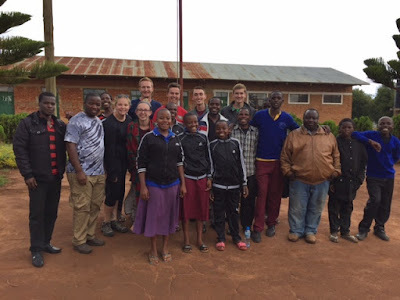 We drove to the Bomalang’ombe school, which has a complete water system installed that has never worked. Our hypothesis was that the pump was not strong enough to pump the water up the hill to the tank. Luckily, the pipe inside the well was flexible, so we are able to pull the pump system out to investigate the issue. We discovered that the pump was full of silt, so we disassembled, cleaned, and reassembled the pump. The next day, after a refreshing breakfast of chapatti and homemade mango jam and bread, we took a short bus ride to Mwatasi. The pastor, village chair, and multiple members of the water committee led us around the village to display the current water situation. During this tour, we took GPS measurements and observed the inefficiencies of the current system. It was discovered that the distribution system was undersized, only able to provide 20% of the necessary water to the village. Upon meeting with the water committee we discovered that there was a region of the village, Manyigi, that had no access to water at all. Due to the lack of water, the villagers currently collect water from local surface sources. A water test proved that these sources contained contaminated water that should not be consumed. Therefore, Manyigi was determined to be a priority for water distribution. 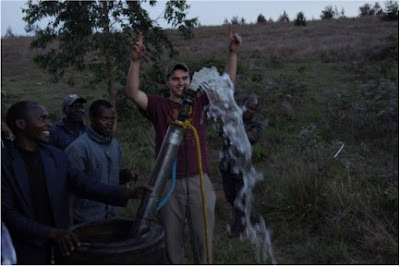 After our tour of Mwatasi we headed back to the school to continue the installation of the pump. We placed it into the well and began taking water from the underground source. A dark-brown water burst out of the line. As the pump was run for a longer time, the water began to become clearer. Sunday morning, we loaded our luggage and departed from the hotel, bound for church. In typical American fashion, we arrived 5 minutes late and snuck in the side door of the warehouse-style church. Heartfelt hymns accompanied by traditional African percussion made up a majority of the catholic service, which also contained a most likely great sermon, though none of us Americans understood any words besides ‘Jesu’. After exchanging gifts of patterned cloth (from the Tanzanians) and various utensils (from the Americans) the congregation filed into the road adjacent to the church for the church auction. This became quite a spectacle as American candy was passed around and Paul dominated the auction and proudly claimed his lumber prize, before donating it to an elderly woman in the crowd. The day continued after we drove to Bomalang’ombe secondary school and connected their well the to the tank near the school, which we found to provide thousands of liters of clean water per hour. We enjoyed lunch with a handful of students that had arrived for school and presented gifts of school supplies and balls for the students. Lunch was a delicious Tanzanian dish of potato, onion, egg, and pepper quiche with a side of goat meat, rice, and beans. The headmaster and students got a special treat when Max let them try the Warheads he had carried with him, but the responses were comically negative, since most of them were spat out instantly. Finally, we began our 2+ hour trip back to Iringa, passing our wayside Itonia comrades on the way. That's pretty cool you were able to fix the pump in one visit. Did you teach anyone there to fix it themselves next time?